Jeez. My kids are such tough-hearts. I wonder about them sometimes. Isn’t this the age when most kids realize that the sliced turkey they’re eating came from an actual animal and promptly go vegetarian? Or where parents have to skip past the howling wolf scenes in Little House in the Big Woods? Last month when two chickens died unexpectedly, Col, who discovered the 1st death, was reverent enough to whisper to me, “Emily’s dead,” before scamping off to draw a picture of a “sordfish;” Rose simply begged to see the body. Which is to say that no one cried when I read about Charlotte dying. Truthfully, even I was more moved by the very last lines of the book, where the narrator muses, “it is not often that someone comes along who is a true friend and a good writer. Charlotte was both.” Oh! Good writing is such excellent company; just yesterday, walking past the shelves of new fiction at the library I had to avert my eyes, because I’m currently tangled up with Ann Patchett’s spellbinding State of Wonder. It’s crazy to realize that the season of food processing is over. For months I was propping up this flimsy door, throwing my weight against it while an avalanche of over-ripe tomatoes pressed in. And suddenly, it’s over. Maybe it’s time to take up a new hobby, like cleaning the house. Naaah. I asked Dan, on our deer-butchering date, if he had any aspirations for winter. I love this about Dan. While I’m teetering around under the vague and lofty goal of say, embodying peace or, I don’t know, raising children to love life, Dan will be making precise cuts into his hides and stitching them up into something useful. And then he will finish, put his feet up and relax while I’m consoling myself with ice cream because I’ve completely blown it for the day. :: Last week with rumors of a low of 16F, I picked all the last stalwart garden lingerers (except the carrots, bless the carrots and their hardy hearts). 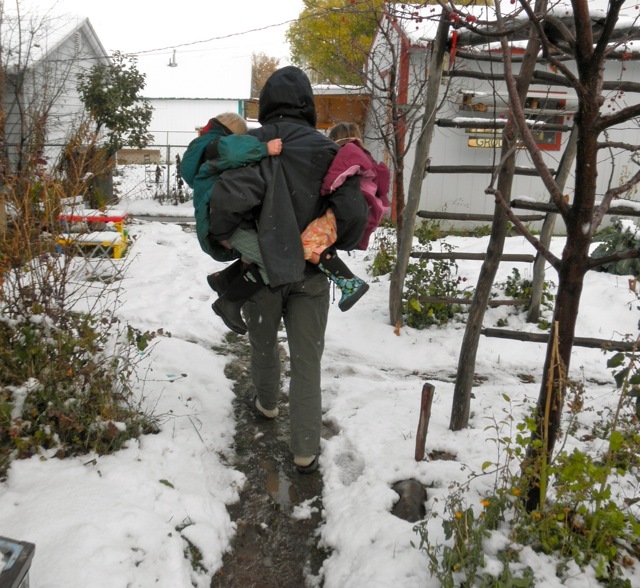 :: Rose and her friends swept snow off the coldframes, because winter is young and we all still think snow chores are fun. 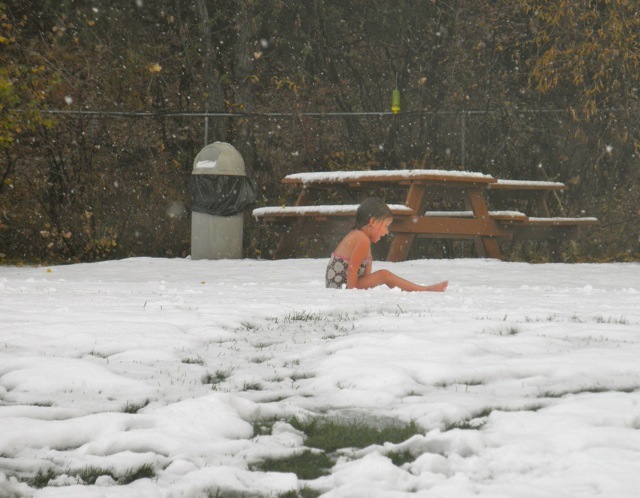 :: We bought a winter pass to the local hot springs, where Rose, that nutty little Rose, likes to roll around in the snow between plunges in the hot pool. :: Sometimes the kids need to go back “in the pouch.” I think it’s healing for everybody. 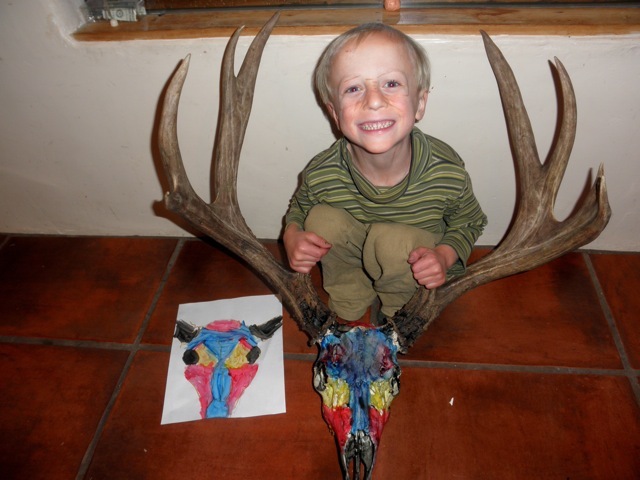 :: There was some disagreement about whether the deer skull would get painted. Col really wanted to paint it, Dan wasn’t so sure. Guess who won that argument? 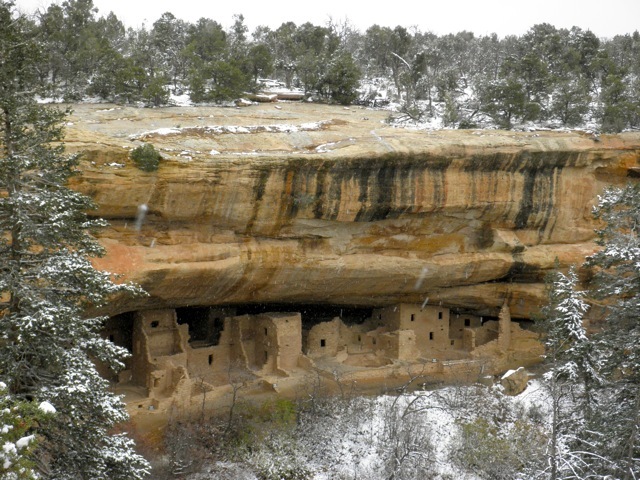 :: Pulling off Mesa Verde (which is a 3-hour round trip drive) on a snowy day is exactly the kind of weekend activity Dan lobbies for while I’m more inclined to take kids to the chlorinated soup of our indoor pool just 3 minutes away. Thank goodness for Dan. Col has a good grasp on the ancient Anasazi days where arrowheads, mud and animal skins were a part of a boy’s daily existence. Rose, whose worldview maintains that nothing much happened before she shot into the world in 2007, was nevertheless pleased with the greasy bag of bakery goods we stopped for along the way. And sure there was a gift shop meltdown, and some complaining on the drive home, but just like childbirth, all I remember now is the magic of those ruins and the snow knitting us together on a beautiful winter day. I too have been tempted to break down and clean now that food processing season is over. I admit, I did a little bit, then went out and aquirred a bushel, a peck and a gallon of apples that I now have to deal with. Next up I’ll be busy with Christmas gifts….anything to avoid cleaning….. Nothing like visiting a tourist spot in the off-season! 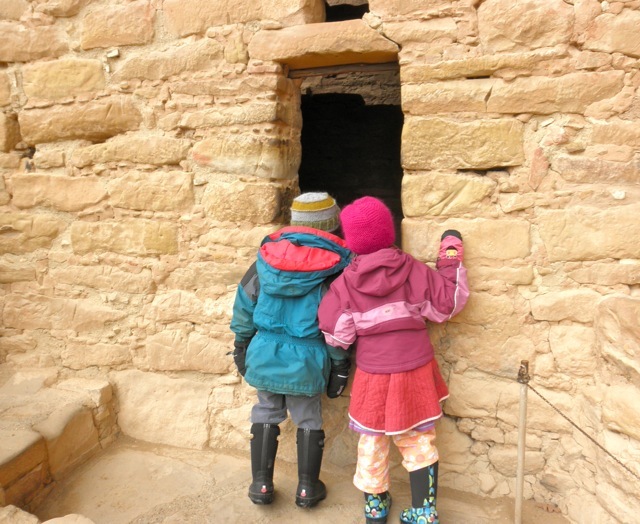 I love how you all are the only ones in any of those Mesa Verde pictures. It’s like going to Telluride in October – you can actually roam around, stop into to places for drinks and relax in the parks. To have Charlotte as a mother? Worth an extra 10 pounds. oh, winter… I was reading Fox’s Dream to my son yesterday and suddenly I became so overwhelmed with memories of winter hiking, the stillness and peacefulness of it, that I almost started crying. Wasn’t thinking about how I hated the chore of making something to eat when my hands were freezing. We haven’t seen the snow since we moved here almost 5 years ago, and the planting and harvesting season is just beginning in Florida, but I guess my body is still rooted around 50N. That was a beautiful trip! Wow, snow! We are just getting our first colder weather here. And I am trying to remember that winter turns to spring. And that I love living where we have four distinct seasons. But me and winter…we’re not the best of friends. So I am trying to enjoy the remaining foliage and not dread the coming cold. I think a snowstorm would completely ruin my forced positve attitude. But it does look pretty in the pictures! The way you talk about Dan always makes me smile. You two so obviously appreciate each other in a rare way. As always, I’m enjoying a chance to watch the changing seasons through your eyes. Thanks, Rachel! Full-term and SUPER excited! The boys measured 7 lbs 5 oz and 6 lbs 14 oz this morning at our “specialist” doctor appointment this morning! Rachel wrote the most amazing birthing story for me. The beauty of it makes me cry everytime I read it. 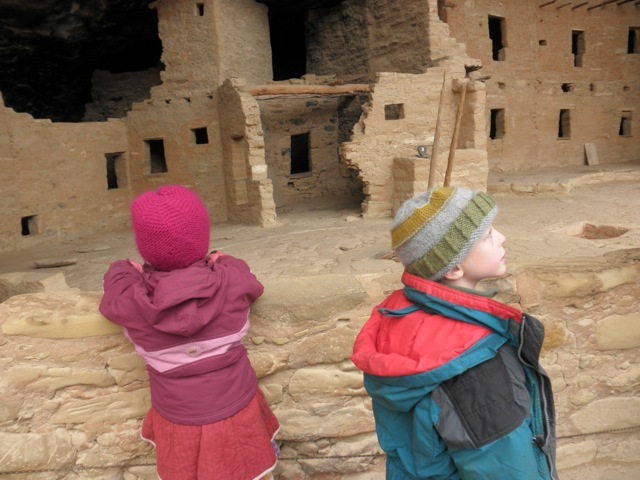 Here’s to birthing, winter, trips to Mesa Verde, and home improvement projects…always better to remember the outcome and to let the painful parts fade into the background. 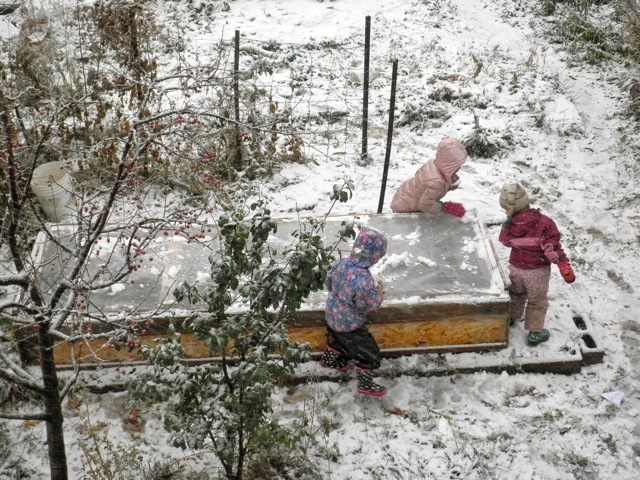 Thank you for the gorgeous photos of the children amid the ruins. And Dan and Col’s handiwork. 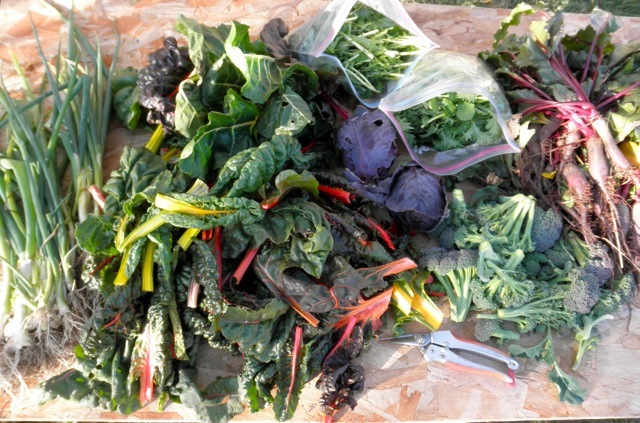 And yours too (the garden produce)! I am so glad I stumbled on your site and your writing. You know, my son was almost 5 when he read _Charlotte’s Web_, and he sobbed at the end of it, asking why I gave him a book to read when I knew that it would end up sad. I still get teary-eyed about it. But I believe that kids’ reactions to books are so much about what else is going on in their lives. He had just finished preschool, and on the last day of preschool also lost his favorite lovey, so I think he was feeling vulnerable about loss. Another year or so later, he skated thru the Harry Potter books with nary a sniffle about the death of beloved characters. (I, on the other hand, cried when Hedwig died). Have you read the Mrs. Piggle-Wiggle series? That was a big hit around kindergarten/first grade, and still a favorite. Also the Roald Dahl books. 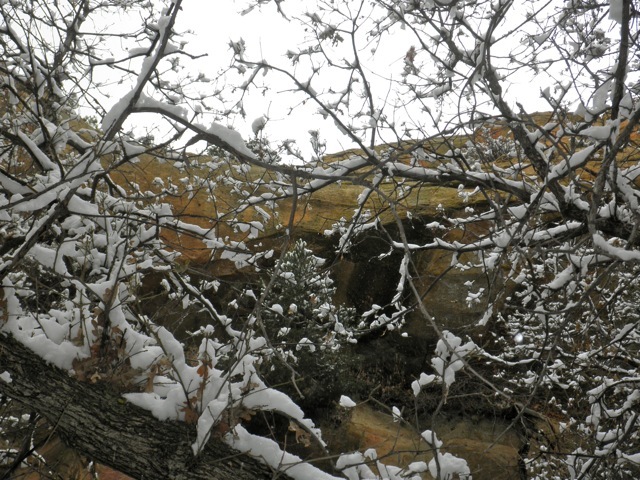 wonderful pictures of mesa verde in the snow and all the others too. I think the kids will remember many of their experiences but mostly the love they receive from you two. Wow!! What an amazing adventure! How cool to be able to say “we bought a winter pass to the local hot springs”. 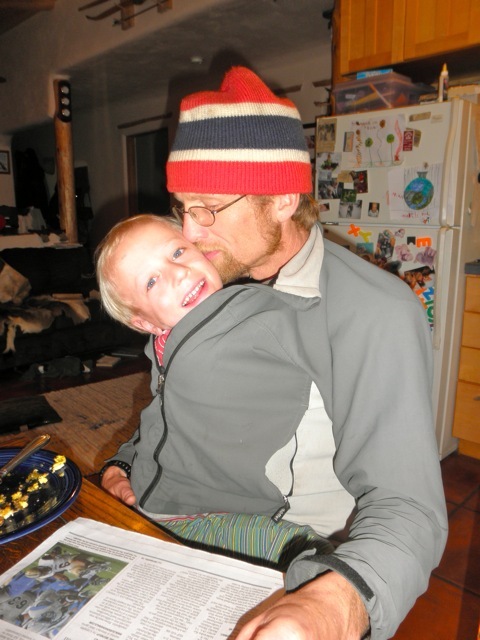 Gonna grab our kid and throw him in a pouch this evening; he used to love that, too. :). Thanks so much for sharing! look! a dan sighting! i surely love the back-in-the-pouch moments. 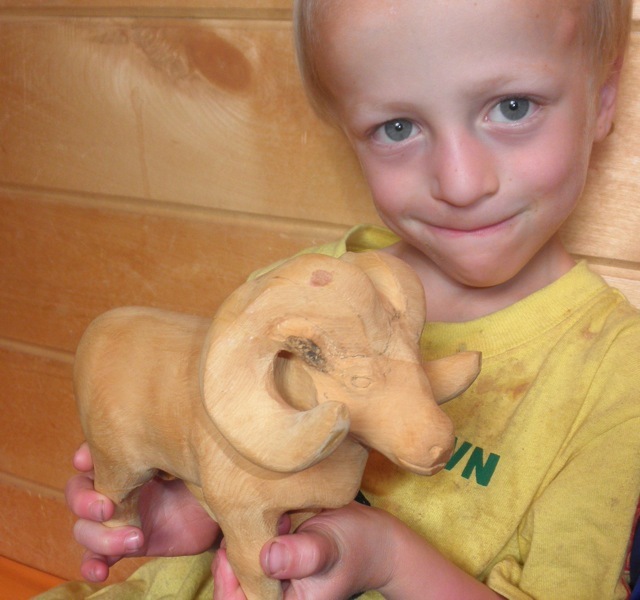 How inspiring that Dan carved that bighorn sheep (is that what it is?) while you were in Denver. It’s cool that he has something to show for all that time away from home, and a reminder of Col’s first tender days. Beautiful! i’m a neighbor from north a ways (montrose). i enjoy your blog. Rachael, I’ve been meaning to drop by and give a woot woot for the deer! Mike brought home an antelope yesterday – some of which is in the crock pot becoming stew as we speak…and the man’s out looking for elk today…we shall see. I loved charlotte’s web…and have been debating reading it to my four-year-old; the girl who ran excitiedly out to see that antelope in Mike’s truck yesterday, but who also gave a full week over to mourning her caterpillar. Hope you’re having a good weekend! Thanks for saying hello. I do appreciate it!